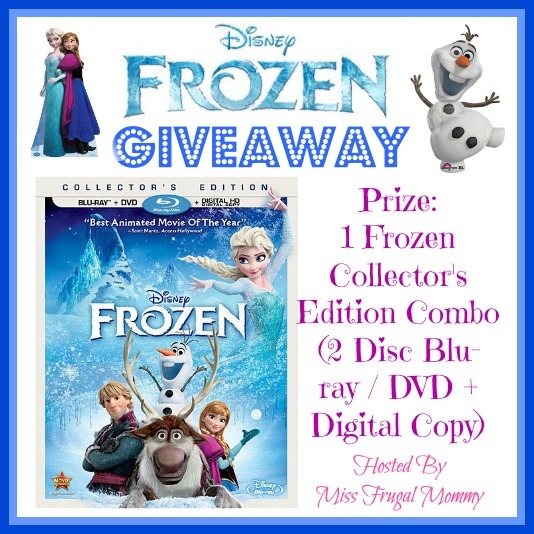 Miss Frugal Mommy and Cindi's World have teamed up with a fabulous group of bloggers to offer our fans the chance to win their very own copy of Frozen! Why? Because we just love our fans so much and want one of you to win this very popular Disney movie just in time for the holidays. This would be the perfect Christmas gift this year for the Frozen fan in your life. The giveaway form is super easy, you don't have to jump through hoops, simply follow the fabulous hosts on their social media networks. This giveaway is open worldwide. Enter to win in the giveaway tools below, all entries will be verified, one entrant per household or you will immediately be disqualified. Winner will be contacted via email and has 48 hours to respond before a new winner is chosen. Prize fulfillment is the responsibility of the sponsor and not the participating bloggers. Good Luck!! !